Learning to be proud of my half Chinese, half French heritage is something that I’ve honestly had to grow into over time. Growing up, it wasn’t something I was amped about. Half?? Why couldn’t I be a whole of something?! Back then, it meant feeling like I never fully belonged to either side. It meant the occasional double-take when it was just my brother and I hanging out with my (very) Caucasian-looking dad. And it meant countless questions about my ethnicity - from strangers - who often couldn’t help themselves but ask: “what are you?”. I know they were just genuinely curious, but as a sensitive kid, it made me feel a bit like a weirdo. At home, the cultural blurriness was a blessing in disguise. Especially in the kitchen. Sure, I ate my fair share of “normal” stuff, like kid-friendly peanut butter sandwiches, chicken noodle soup and boxed mac and cheese. But then again, I also thought stirfried pasta was a thing. And thank goodness my Asian mum insisted on cooking pasta in her beloved wok. Because wok-fried pasta is bomb. I’m tapping into that half-Asian side with today’s recipe. It’s based off a classic pad thai, which was a dish I first learned to cook while traveling in Thailand. Although, I know you’re not here to just read about another standard pad thai recipe, so I made some “new school” modifications. The big difference here is a serious switch-up when it comes to the noodles. Spaghetti squash anyone? Oh and we’re pressing pause on the meat / eggs (yup, this one’s vegan). I’m assuming most of you already know all about the wonders of spaghetti squash. Bake it in the oven - and then with the simple scrape of a fork, you have “noodles”. It’s kinda like... magic! And besides the fun scooping part, they’re also delicious, healthy and easy to prepare. In the spirit of full transparency, I’m not going to try and convince you that spaghetti squash noodles are exactly like the real thing. They’re not. That said, spaghetti squash is a great substitute for noodles when you want to be a little healthier and the sauce is the real star of the show. While most people cut their spaghetti squash lengthwise, I'm here to convince you not to. The strands/fibers inside the spaghetti squash actually run horizontally. So, if you cut your spaghetti squash the same direction, then you'll end up with longer noodles. Isn't that what we all want?! Cutting spaghetti squash lengthwise also requires two additional cuts: slicing off the hard stem, and cutting off the bottom of the squash. The horizontal approach of cutting through the wide middle of the squash allows you to skip this. Which is so much nicer, given how hard it is to cut squash in the first place. Give it a try. I promise you won't go back! As the squash roasts, you'll bake the tofu at the same time. Baking tofu in the oven achieves a crispy exterior, without oil. Since the spaghetti squash noodles will take a quick visit to the pan (after baking), it's important not to overcook them in the oven. Keeping the noodles slightly el dente will make for the best texture in the end. 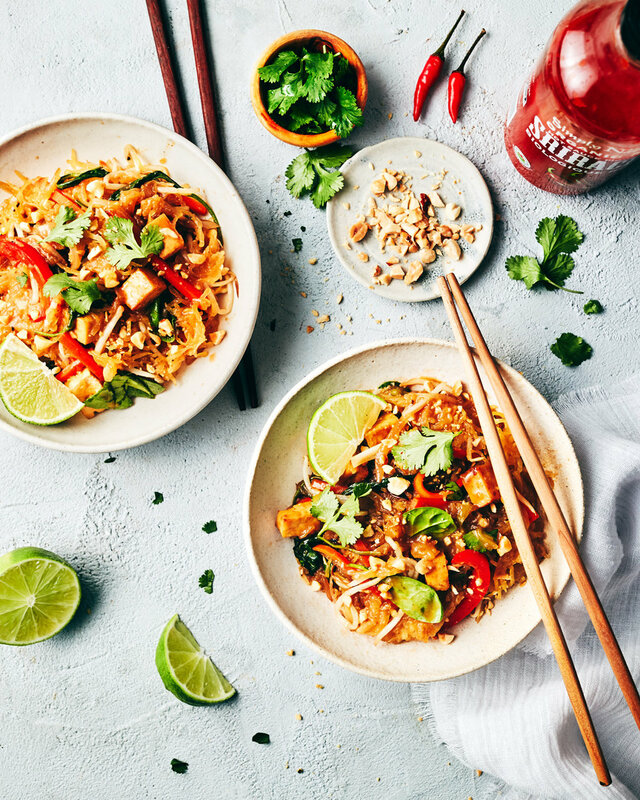 Sauce-wise, we have an awesome 4-Ingredient Vegan Pad Thai Sauce, which makes the perfect quantity for this recipe. Otherwise, substitute store-bought sauce. Top with chopped peanuts, cilantro and fresh lime slices - and serve warm. Preheat oven to 425°F. Line two baking sheets with parchment paper. Carefully slice the spaghetti squash in half, horizontally (see note). Scoop and discard seeds. Place the top and bottom half of the squash on one baking sheet. Bake squash for 30 minutes. Cut tofu into bite-sized cubes (1/2-inch or 1-1.5 cm). Spread tofu onto the second baking sheet. Slide it into the oven with the spaghetti squash. Bake tofu for 15 minutes, or until golden brown. Once the veggies are prepped, heat up 1 tablespoon of oil in a wok (or a large cast iron skillet) set on high heat. Add shallots and cook for 3 minutes, stirring regularly. Add carrots, red peppers, baked tofu and garlic. Cook for another 2-3 minutes until tender. Add spinach and green onion and cook for 1-2 minutes, until the spinach begins to wilt. Pour 2 tablespoons of pad thai sauce into the pan and toss to coat. Scoop everything out of pan and set aside. Use a fork to gently scoop the squash out of the skin. Reheat wok over high heat and add 1 tablespoon oil. Add half the squash "noodles" to the pan and cook for 1 minute, before adding the remaining noodles. Pour 3 tablespoons of pad thai sauce on the noodles. Stir to coat. Then add cooked veggies, bean sprouts, and remaining pad thai sauce. Toss to mix well. Garnish with peanuts, cilantro, lime wedges, and Sriracha (if desired). -Most people cut their spaghetti squash lengthwise. However, for longer noodle strands, it's best to cut spaghetti squash horizontally. -A wok is highly recommended for this recipe, but you could also substitute with a large cast iron skillet. You need at least a 12-inch/30 cm skillet, otherwise cut this recipe in half. -*Can be substituted with small red onion, sliced very finely.